Everyday, we look at dozens of websites. The structure of these websites is defined in HTML, the lingua franca for publishing information on the web. Your browser’s job is to render the HTML according to the specs (most of the time, at least). You can look at the code behind any website by selecting the “View source” tab somewhere in your browser’s menu. HTML consists of so-called tags, like the A tag for links, IMG tag for images and so on. 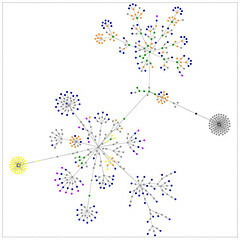 Since tags are nested in other tags, they are arranged in a hierarchical manner, and that hierarchy can be represented as a graph. I’ve written a little app that visualizes such a graph, and here are some screenshots of websites that I often look at. <p>The Onions, SAAS's awesometastic vocal group is singing again tonight at the Arts Center. If you're an alumni, you can get your ticket for the low low price of $4, which is actually pretty good considering adult tickets are $10 a pop. Like I said, it's tonight at the Arts Center, 7pm. I'll be there, I saw Paige Pauli yesterday and she said she'd be there. Anyone else going? <p>My first order of business: Install Firefox (if I can). I search the Boeing Intranet for Firefox. Looks like everything should be kosher. Awesome. <p>That's right, you NEED to watch ALL the credits, then watch the last scene. Just about everyone at the <a href="http://www.cinerama.com/">Cinerama</a> waited and then went "OOoooooo!" <p>Boeing also covers continuing education which is cool, and they cover things that aren't even related to your job. So I'm going to try and get my pilots licences this summer. All paid for by Boeing. Sa-weet. <br />My hopes, my dreams, my aspirations. <br />My trials and tribulations. <br />Copyright &copy;2006 by Andrew Ferguson. All Right Reserved. <br />The information in this blog is provided "AS IS" with no warranties, and confers no rights. <br />This weblog does not represent the thoughts, intentions, plans or strategies of my employer. <br />It is solely my opinion.